The animals whose flesh ends up on supermarket shelves live wild before dying a humane death... What's more, one kangaroo consumes about a third as much plant material as a sheep, and just 13 per cent of the water. This is a significant benefit in [Australia,] a country that suffers periodic droughts, which climate change may worsen. It cuts down on greenhouse gases! 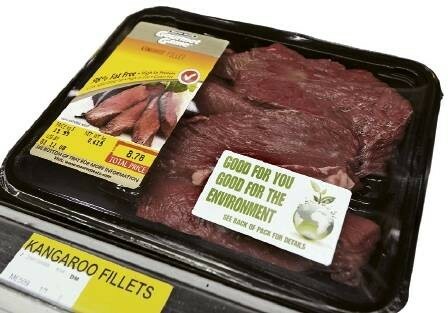 According to a report commissioned by Greenpeace, switching from beef to kangaroo meat would help cut 15 megatons of greenhouse gas emissions by the year 2020. Why? Because their farts are virtually methane-free. Way to go, kangaroo farts! Eating kangaroos saves polar bears. Why? Because this video says so. And personally, I think polar bears are way awesomer than kangaroos. By law, adult kangaroos must be killed by a shot to the head from a high-powered rifle. A report published this year by the animal welfare group RSPCA Australia says this leads to instant insensibility quickly followed by death. Kangaroo harvesters are good shots: according to the report, around 95 per cent of carcasses were indeed shot in the head. Things get more complicated if the roo is female. A doe usually has a young joey in her pouch, and by law it must be dispatched by a blow to the head. In practice, it is coshed with a metal pipe or swung against the side of a truck. "Blunt trauma is an aesthetically displeasing procedure, but when done correctly is an acceptable method of euthanasia," says the RSPCA report. Kangaroo is tasty! Esquire Magazine says it tastes like "sweet filet mignon." There's nothing like a delicious steak to distract me from killing an animal by bashing its head against the side of a truck. It's paleo-friendly! Just like grassfed meats, kangaroo is lean, healthy, low in polyunsaturated fat and loaded with long-chain omega-3 fatty acids and conjugated linoleic acid (CLA). You can pretend you're eating something else! Just as you find the notion of eating "pork" and "beef" more palatable than chowing on "pigs" and "cows," you can just close your eyes and tell yourself you're dining on "australus" meat. Yum! It's available in the U.S.! 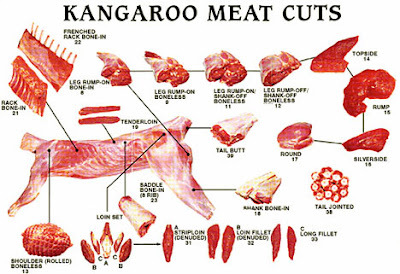 You can order kangaroo australus meat from a bunch of places online, like Exotic Meats USA, Fossil Farms, or -- if you're looking to buy in bulk -- Marx Foods. Some butcheries specializing in exotic meats (like San Francisco's Polarica) carry kangaroo. Or, if you're in New York and want someone else to do the cooking, try the kangaroo skewers at Eight Mile Creek. The final reason: Kangaroos have faces and souls. I get that Tony Horton is a vegan and doesn't like ingesting things with faces. 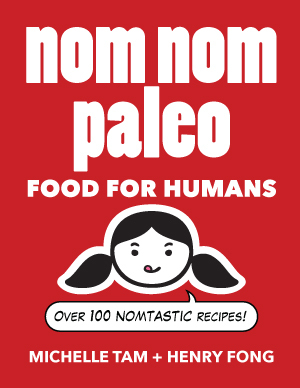 But I've gone over to the paleo side of the fence, and Robb Wolf's my guru now. And I believe him when he says I should eat animals -- even cute ones.